It is well established that marketing efforts such as advertising are among the factors that can negatively affect health behaviors. Media literacy education can lessen this impact by developing an individual’s skills to critically evaluate marketing and advertising messages. Yet, media literacy education strategies and their implementation processes are relatively understudied. A new study published in the Journal of Nutrition Education and Behavior found that simple forms of media production can be a feasible activity in a behavioral intervention targeting adults. Study participants were enrolled in a six-month SIPsmartER intervention to reduce consumption of sugar-sweetened beverages. Media production was incorporated as a 20-minute activity within a larger intervention during which participants could individually produce two types of counter-ads: slogan modification and truthful label. Slogan modification involved replacing a key word from a well know sugar-sweetened beverage slogan with a new word that better reflected reality of beverage consumption. 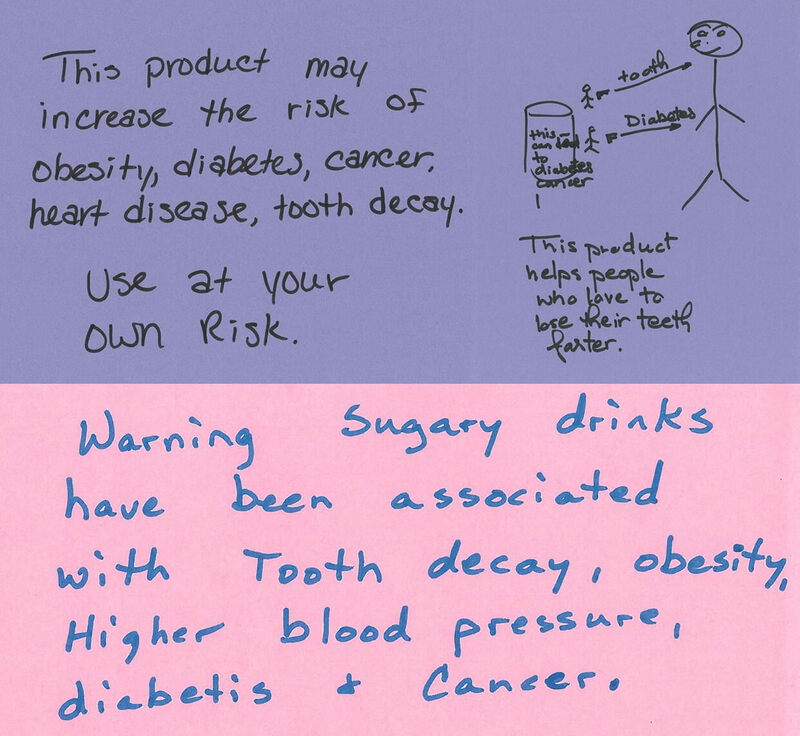 The truthful labeling activity involved creating a new label for a sugar-sweetened beverage that included information normally missing such as the health risks associated with high intake of sugary drinks. Two examples of participant media productions. After analysis of participants’ counter-ads, health risks, particularly weight gain/obesity, were the most frequently used content. No counter-ads included health benefits. In addition to incorporating class content, participants used their own thoughts in the counter-ad content. Over half of the ads used content not discussed in class such as how acid in soda can hurt the digestive system. All nutrition facts in counter-ads were accurate although some of the stated health risks were inaccurate. Compared with slogan modification, truthful labels were more likely to include nutrition facts. The majority of counter-ads were meant to be persuasive for drinking fewer sugar-sweetened beverages. This study extends what is known about incorporating media literacy techniques, particularly counter-ad production, into behavioral interventions. This is particularly useful for nutrition educators working with populations served by Supplemental Nutrition Assistance Program–Education and the Extended Food and Nutrition Education Program, who may be more likely to consume unhealthy and highly advertised foods and beverages, such as sugar-sweetened beverages. Future research should address participant acceptance of media production and how media production affects behavioral outcomes. The article is “Implementation of Media Production Activities in an Intervention Designed to Reduce Sugar-Sweetened Beverage Intake Among Adults,” by Kathleen Porter, PhD, RD; Yvonnes Chen, PhD; Hannah Lane, PhD, MPH; and Jamie Zoellner, PhD, RD (http://dx.doi.org/10.1016/j.jneb.2017.06.009). It appears in Journal of Nutrition Education and Behavior, volume 50, issue 2 (February 2018) published by Elsevier. Full text of the article is available to credentialed journalists upon request; contact Eileen Leahy at +1 732-238-3628 or jnebmedia@elsevier.com to obtain copies. To schedule an interview with the authors, please contact Kathleen Porter, Department of Public Health Sciences, School of Medicine, University of Virginia, kjporter@virginia.edu. An audio podcast featuring an interview with Kathleen Porter is located at www.jneb.org/content/podcast. Excerpts from the podcast may be reproduced by the media; contact Eileen Leahy to obtain permission.